A former professional footballer has died in hospital four days after he was hit by a motorcycle in County Durham. Frank Wayman, 76, was walking his dog when he was struck by the Suzuki bike as he crossed the A167 near Ferryhill. The life-long Chilton resident played for several clubs, including Chester, Darlington and Preston North End. He died in hospital on Thursday night after sustaining serious head injuries. Mr Wayman's dog was killed and the motorcyclist suffered minor injuries. 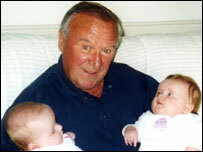 Mr Wayman leaves a wife, two daughters, two granddaughters, two grandsons and two great-granddaughters. In a statement his daughters, Julie and Gail, said: "We are all distraught at his sad death and he will be sorely missed. "Our dad was a family man who, on the night of the accident was out with his dog, Megan, on his daily seven-mile walk. "He loved the outdoors and after he finished his football career he remained very active, playing bowls at Ferryhill, golf and caravanning in the summer. "He lived in Chilton all his life and everyone in the area knew him as he was a very social person." Durham Police are appealing for witnesses to the collision on Monday at about 1700 GMT.